Neutron stars typically form when a large star dies in a supernova explosion. The outer layers of the star are cast outward to form a supernova remnant, while the core of the star collapses into a dense neutron star. What keeps a neutron star from collapsing under its own weight is the pressure of the neutrons pushing against each other, similar to the way electron pressure works in a white dwarf star. But there is a limit to how much weight the neutrons can counter, known as the Tolman-Oppenheimer-Volkoff (TOV) limit. This limit means that a neutron star can’t be more massive than about three solar masses. More than that, and it would collapse into a black hole. Because of this limit, it’s generally thought that the supernovae of most large stars produce neutron stars, but the supernovae of really large stars can produce black holes. But a recent paper in Astronomy and Astrophysics proposes that some really large stars might produce a neutron star that is more massive than the TOV limit, which only collapses into a black hole later. 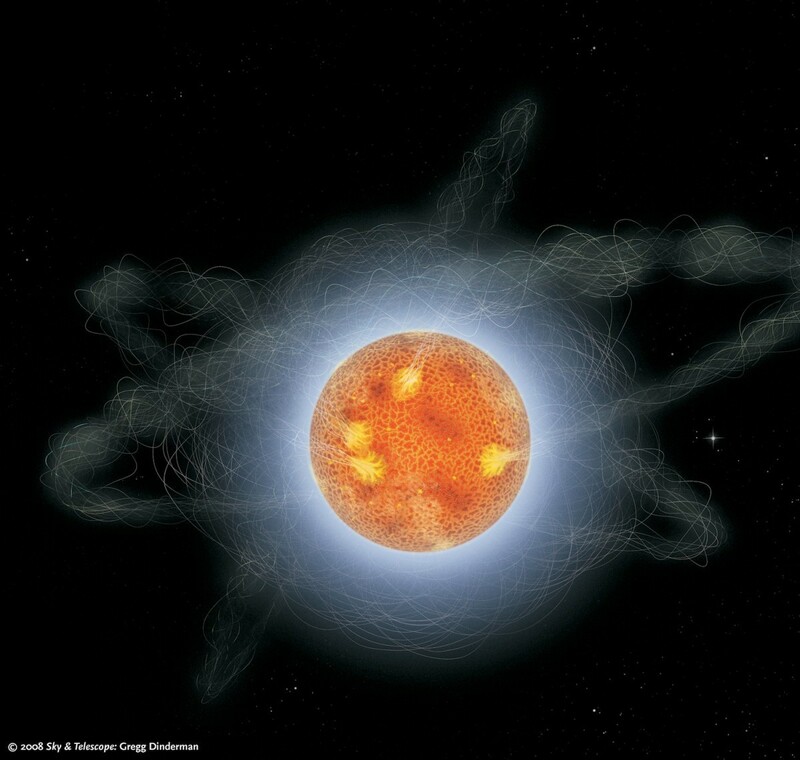 In the paper, the authors propose that if the progenitor star is rapidly rotating, the resulting neutron star it produces could also be spinning rapidly. Since the TOV limit is for a non-rotating (or slowly rotating) neutron star, a fast-rotating neutron star could be over the limit. Basically, the rapid rotation would cause the neutron star to bulge out a bit, preventing it from collapsing into a black hole. 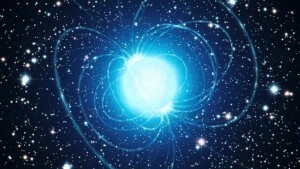 Of course neutron stars have strong magnetic fields, and this means that they radiate electromagnetic energy as they rotate, which causes them slow down over time. So eventually these supermassive neutron stars will slow down enough that they collapse into a black hole. The Lorimer burst, first observed FRB. What’s interesting about this idea is that it could explain a mysterious phenomena known as fast radio bursts, or FRBs. These are bursts of radio energy that last for a fraction of a second, but are extraordinarily bright. They don’t repeat like radio pulsars, but instead just occur as a single burst. They appear similar to gamma ray bursts, but don’t seem to have a corresponding burst of gamma rays, or even x-rays. Neutron stars have a strong magnetic field, but uncharged black holes don’t have magnetic fields (known as the no-hair theorem). So when a supermassive neutron star (with a strong magnetic field) slows enough to collapse into a black hole (which can’t have a magnetic field) the magnetic field must snap free. This would produce a large burst of radio energy without the burst of x-rays and gamma rays that occur when a supernova-produced black hole forms. The authors have named such objects blitzars. So blitzars could explain these FRBs. To be sure, we’ll need to analyze the spectra in more detail. Right now we only have a handful of FRB observations, which isn’t enough to confirm them as FRBs. There are also other possible solutions to the mystery, such as massive stellar flares, and binary white dwarf or neutron star mergers. But it could be that these strange radio burst are simply the result a neutron star that has been over the limit. Paper: Heino Falcke1 and Luciano Rezzolla. Fast radio bursts: the last sign of supramassive neutron stars. A&A 562, A137 (2014). I’ve always wondered how white dwarf and neutron stars are able to withstand collapse, and this post clarified that. I’m now curious about what an uncharged backhole is, and why it doesn’t produce a magnetic field. Thanks Brian! You are an eloquent science communicator!